Order will come into your home and help you organize your closet, bedroom, kitchen, garage, pantry, linen closet, storage unit, children's room, play area, etc., by setting up organizational systems that are easily managed and maintained. We removed everything from the garage, sorted and purged unwanted items and moved items into the house that didn’t belong in the garage. We then installed metro shelving in an L shape along the garage walls and installed hooks for all gardening supplies and tools. We set up a shelving system for park & school items that come in and out of the garage regularly. We also arranged for a donation pick up to support a local charity. 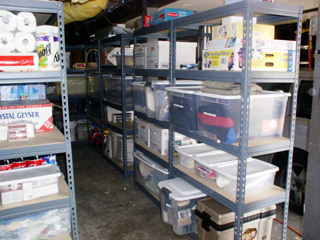 Finally, we put everything back in the garage in organized, labeled storage bins. We wanted to create a storage area with shelves so that items weren’t stacked up all over the floor. 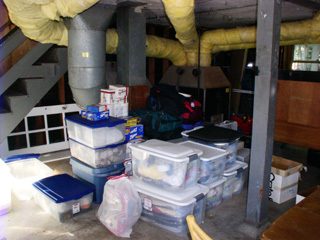 We started by sorting and purging unwanted items then organized everything in the garage. Then we installed industrial garage shelving in a U shape for easy access. Finally, we put everything back on the shelves in organized, labeled bins and boxes and grouped them in categories, children’s clothing, toys, tools, computer hardware, etc. We wanted this office closet to function as it was originally intended when installed. So, we sorted, purged and organized the stationary, bills, memorabilia, paperwork etc. and created like areas to keep items such as all cards, envelopes and paper stored in easily accessible boxes that were then labeled & returned to the shelves. We removed everything from the pantry, purged unnecessary items- creating donation, garbage and for-sale piles. We had custom shelves built on the left wall to match the rest of the pantry. 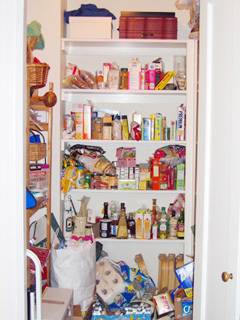 Finally, we put the remaining items back into the pantry, organized in groups: baking, grains, paper goods, drinks, snacks, canned goods, etc. We then combine small items into labeled baskets and canisters. 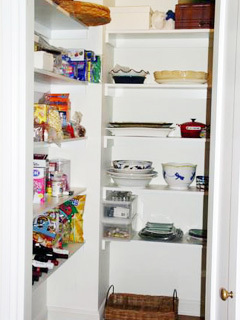 We removed all the bags from the cupboard above the refrigerator and then we had shelves built to store items that are not used on a frequent basis. Turning this otherwise useless deep storage cupboard into a place where they could store seasonal and holiday items was a wonderful fix, and it happened to free up other cupboard space.